The English Language Centre offers credit-rated elective and core modules in English for Academic Purposes at stages 1, 2 and 3. See which ones may be available to you. ELC102 English for Academic Purposes (Stage 1 elective, Semester 2). This module is designed to help students whose first language is not English to develop and refine their ability to use English appropriately and effectively in professional and academic contexts at stage 1. The module enables students to develop their academic vocabulary, academic writing, critical thinking and research skills along with their ability to deliver academic presentations and participate in academic speaking scenarios. The module is interactive in nature and students are expected to be active participants in classroom activities. Students are also expected to demonstrate a commitment to independent learning to consolidate their progress. This is also available for exchange students. ELC1001 Professional Communication Skills (Stage 1 elective, Plymouth Plus): Students will explore a range of different genres of the English language, develop their understanding of the appropriate use of English in a variety for academic, work and social situations and improve their written and spoken communication skills. Students will work on a group project throughout the immersice module which will develop these skills. They will also be required to produce a portfolio which evidences the development of their communication skills. Students who choose this module should be willing to engage in self-directed group work. ELC202 English for Academic Purposes (Stage 2 elective, semester 1): This module is designed to help students to further develop and refine their ability to use English appropriately and effectively in professional and academic contexts at stage 2. This module has a strong focus on sustainability and students will engage in a group presentation and an individual small-scale research project relating to this theme. Students will be expected to review and reflect on their language development throughout the module, and to identify and adopt appropriate strategies to make progress. This course requires consistent, steady work throughout the semester. This is also available for exchange students. ELC310 Professional Communication Skills for International Finance (Stage 3 core module for students on BA International Finance, semester 1). This module is designed specifically to help third year International Finance students develop the English language skills needed for their course of study. They will do this by engaging with a range of materials on current affairs topics relating to the world of International Finance. Students will write a business report, work in small groups to give a presentation in regard to an investment opportunity, complete a language learning portfolio and take part in a job interview. This course requires consistent, steady work throughout the semester. ELC311 English for Accounting and Finance (Stage 3 elective module for students on BA Accountancy and Finance, semester 1). This module is designed specifically to help third year Accounting and Finance students develop the English language skills needed for their course of study. They will do this by: working with authentic subject specific materials (newspaper articles, television progammes, websites, etc. ); engaging in an individual and a small group presentation relating to the field of Accounting and Finance; producing a written report based on a visit to a local business. Students will also complete an e-portfolio which is designed to develop academic writing skills. This course requires consistent, steady work throughout the semester. 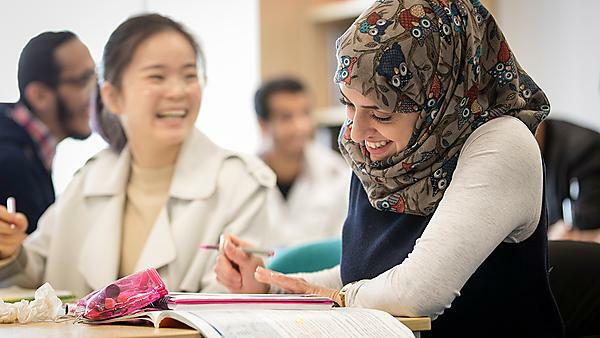 ELC312 English for Global Communication (Stage 3 elective, semester 2) This module is designed to develop students’ understanding of intercultural communication and to develop skills in using English as a Lingua Franca. They will do this by exploring cultural/linguistic differences, developing skills to use English effectively in different cultural and linguistic contexts and in a professional context in the UK. In short, students will develop the intercultural competencies required of an effective member of global citizenry. Students will critically examine theories of culture and language (essay), engage in a group consultancy project with a business in Plymouth (written report and video) and reflect on their group work experiences (written). This course requires consistent, steady work throughout the semester. This is also available for exchange students. ELC314 International Business Communication (Stage 3 elective module, semester 2). This module is designed to help students to develop and refine their ability to communicate effectively in the global business environment encompassing different national cultures, business practices and systems. They will do this by working on a business report focusing on business ethics; by giving a small group presentation comparing their chosen business with another one; by completing a language learning portfolio; and by analysing and discussing a television business programme in a group presentation. Students will need to engage with the module throughout the semester to do well in it. This is also available for exchange students. ELC315 Professional and Academic Communication (Stage 3 elective, semester 1): This module is designed to help students to further develop and refine their ability to use English appropriately and effectively in professional and academic contexts at stage 3. They will do this by reviewing their language development by identifying an area of weakness and adopting appropriate strategies to make progress in that area; engaging in a small research project which they will present to the class; writing an essay and practising relevant professional and academic English skills in small class groups. This course requires consistent, steady work throughout the semester. This is also available for exchange students.